Ah, back-to-school: so many feels about this time of year. As a kid, it was the excitement of meeting new friends and connecting with those I hadn't seen over the holidays, the chance to reinvent my style a bit, and, yep, a bit of melancholy as I mourned the passing of another summer. Now, as a parent whose kiddo is suddenly a preschooler, there's a whole other bevy of emotions to deal with! But one thing I've found to be helpful is to focus on making the transition fun and positive in any way I can, including what I send to school with my daughter. From indoor shoes and craft supplies to the contents of her lunch kit, like all parents, I want my child to be well-taken-care-of and smiling. That's why I've put together my favourite nut-free, vegetarian, healthy, and delicious lunchbox ideas and tips. Say goodbye to using a million containers or baggies and buying loose, pre-packaged items. Having one solid, segmented kit is easier on you as you prep lunches, eliminates waste, and won't get lost like a bunch of tiny Tupperware tubs. LunchBots containers are built to last, eco-friendly, dishwasher-safe, and thanks to their 19/8 stainless steel, guarantee your child's food to be safe from leached chemicals. Find LunchBots and other durable, safe, high-end lunch essentials at Cravings Boutique. Keep food cold until noon by taking peas, fruit, or mini muffins from the freezer and popping them in the kit come morning. Yogurt (such as above where I mixed Greek yogurt with chia) can be frozen right in the kit the night before; then when you're throwing the rest of the lunch together the next day, just add nut-free granola, frozen raspberries, or whatever your kid enjoys, right on top. Then, just fill the other segments. Keep in mind that LunchBots aren't built for soupy stuff but don't worry, this chia mixture won't leak. Haven't made it to Cravings yet or just need an extra kit? 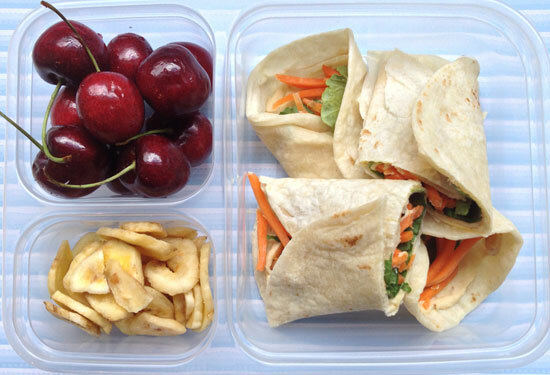 Use muffin liners keep foods separate like this lunch idea from Kid's Kitchen until you stock up on solid state. For kids and adults alike, eating is about the experience and ten-to-one, a little one will pick a pinwheel sandwich over a regular one. Are you a mom that's extra? Or, got a child who is and you're just trying to keep up? Cookie cutters make for an extra fun sandwich and you can turn anything into a character. Gotta admit, I'm not at this level... but we can agree it's adorable and is all kinds of goals. For more inspo like this (or to just feel inferior for a moment because that's healthy, right? ), head to Pinterest. Fruits and vegetables can be time-consuming to wash and pare, but keeping containers of ready-use ones in the fridge makes packing a breeze. It's also helpful for when you go to grab a snack! Sandwiches are boring day after day and tortillas offer a satisfying alternative. A hummus wrap with shredded carrot and lettuce (via Pinterest) is quick to put together but its ruffage and protein will sustain your little until dinner. I've been making pestos for my daughter since she started to eat solid food because you can put sooo many nutritious ingredients in without recognition and it's good with hot pasta or cold. 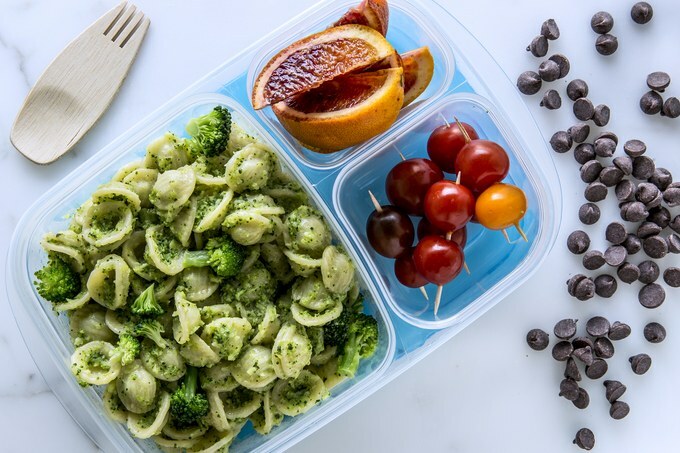 At home, walnuts are my go-to add-in for a classic basil pesto but schools are largely nut-free so may I suggest this recipe via Bon Appetit which sneaks in broccoli. Host a BBQ and have salads of every variety taking up valuable fridge space? 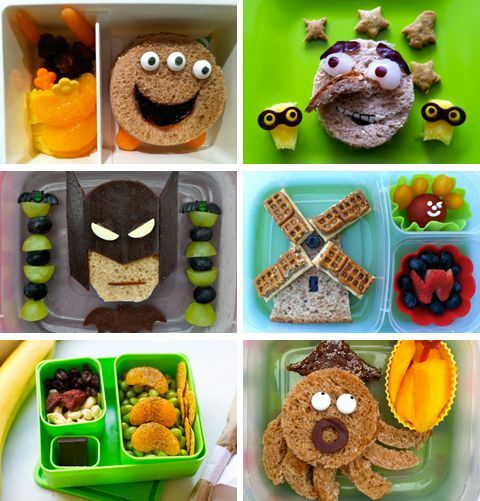 Get 'em out of the house by sending your kids' faves to school with them. The Kitchn suggests a quinoa and black bean one which looks pretty close to something I make. We usually have a container of cooked quinoa in the fridge because it's a high-protein alternative to pasta and easily amps up any salad. If your little loves a PB&J, try WowButter, pumpkin seed butter, or our family favourite, sunflower seed butter. It's a slightly different take on a classic but trust me that spread on sprouted grain bread with bananas or on a piece of celery with raisins, you'll forget about the Jif. As a long-time vegetarian, I often get asked how I get iron and protein into my diet because those are two things that sustain you through the day. My answer? It's a long one, even when I keep it nut-free: eggs, cottage cheese, chick peas (my daughter loves them roasted or raw), black beans, seeds, flax, leafy and dark green veggies... the list goes on. Boiled eggs are an awesome on-the-go option and though I'd peel it first for my daughter, older kids are perfectly capable of doing the work for you. Keep some in the fridge to have on hand! This box is by Goodbyn, also available at the locally-owned and beautifully-stocked Cravings Boutique. Do you have a tip or two I missed or are you excited to try something new? As always, I'd love to hear from you.